Iberis sempervirens is a small but significant portion of my garden. My early season garden is particularly white. The plum trees, evergreen clematis and star magnolia are all going strong in early March. This is when the Candytuft is peaking. It is only for about a month, a little more if the spent flowers are clipped off. 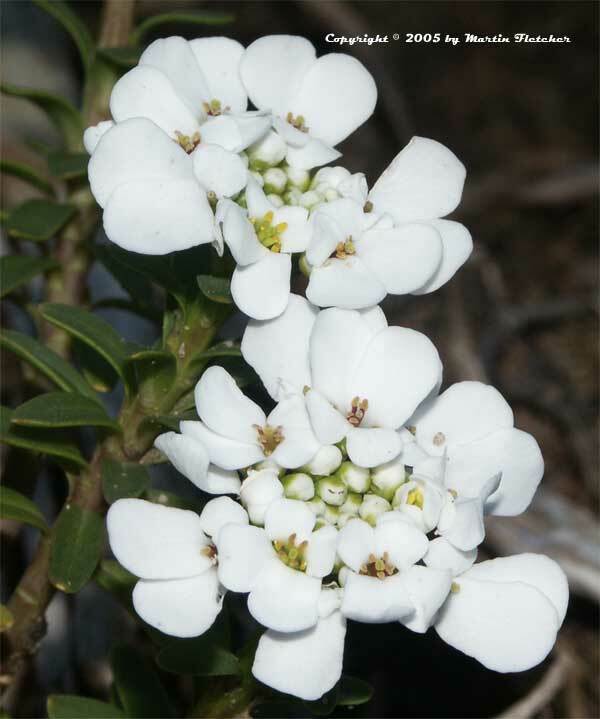 The contrast between the linen white Candytuft flowers and the dark green foliage is great. Iberis sempervirens is all of 6-8" tall but glows in the evening light. I view my garden as a series of moments. This is one of them. Iberis sempervirens is a hardy perennial if given good garden conditions. Candytuft has survived temperatures in the teens. Brilliant white flowers and foliage of Iberis sempervirens - Candytuft. High resolution photos are part of our garden image collection.